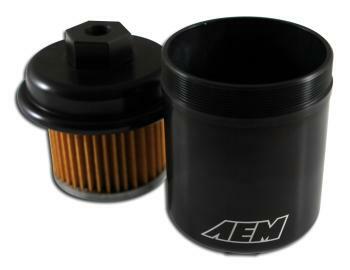 AEM’s High Volume Fuel Filter is capable of supporting fuel flow for vehicles up to 500 horsepower. Double O-ring seals deliver superior leak protection and the filter’s 6061 aluminum body provides excellent durability. The standard high-flow filter element is replaceable and available at most auto parts stores so you aren’t stuck if you need to replace it during a race. This unit is a direct-fit replacement for most Honda/Acura applications or used as a floating application on most vehicles.